Paytm is one of the best online website/app for Mobile/DTH Recharge with cashback offers, Paytm also offering so many cheap deals on shopping. 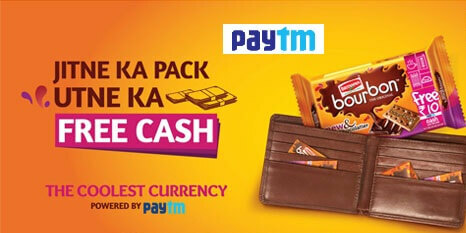 Earlier we share many post about paytm like paytm coupon/promo code and many hot sopping deals. Today we find a offer for you named Paytm Britannia Bourbon Offer in that offer you will get Free Rs.26, Rs.20 or Rs.10 Paytm cash in your paytm wallet from Britannia Bourbon Pack of Rs.26 or Rs.20 or Rs.10, some of lucky winners can also win some exciting gifts by grabbing this Britania Bourbon Biscuit Offer. So purchase Britannia Bourbon from nearest store and avail Paytm offer “JITNE KA PACK UTNA KA FREE CASH”. read full article to know how to avail this offer. first of all buy new pack of britannia bourbon biscuit(Rs.26,Rs.20 orRs.12)from your nearest store. Now open pack and enjoy your biscuit. You will get “Cash Code” inside the pack. Enter your paytm cash code and click on proceed. Now paytm ask you to login or sign up your paytm account. finally you will get free upto Rs.26/20 or 12 paytm cash in your paytm wallet. MyTricksTime advice you to redeem the “cashcodes” between 05:00AM to 11:00AM. This Offer Valid till 15 Dec 2015. Only Valid for Britannia pack having the logo as in image showing on top. Paytm account holder can avail this offer once. One user can avail 6 cash codes till the end of the offer. Hope you like this article, if you have any doubt or question you are free to ask by commenting below or our Facebook page.